Another morning in life and I find myself scrounging around our fridge for breakfast…my favorite of meals and the backbone of any good day. Lo and behold, I find some roasted ham bought from the Salcedo market. Mmmm, I feel my tummy wanting some traditional ham & eggs! A simple, easy, breakfast staple. Yes, can do. 1. Toast three pieces country bread (or any kind of bread you’re in the mood for or have on hand…I think this would also be great with the Monroe bread they make at Ji-Pan or maybe a bread that’s got cheese in it). 2. Prepare a soft-scrambled egg (I only used one egg). Sprinkle a bit of salt on the scramble after it has finished cooking. You can try this with a fried or poached egg as well. 3. Fry the ham lightly with a little oil (I used olive oil but feel free to substitute). I used the roasted ham because it was on hand and because it had a good fat-marbling, but you can use a leaner ham if you’re not a horrible fat-fanatic like me. 4. Stack them up! Bread-egg-bread-ham-bread…or any which way you please! I had my stack with some chopped tomatoes on the side to offset the fatty-ness of the ham. Simple, delicious, perfect…a good start to another day. « Meet my Sushi Gang! Just a suggestion to make a ham-and-egg stack more interesting the next time you make one: mushrooms! It’s something I stumbled upon by accident a few years ago. I was hungry and there wasn’t anything in the fridge save for some ham, a couple eggs, a heel of peasant bread, and half-a-pack of sliced shiitake mushrooms. I julienned the ham and sauteed it with the mushrooms, made scrambled eggs – et voila! Major league sandwich alert! Hi thank you very much for making a comment on my blog, that meant a lot to me. 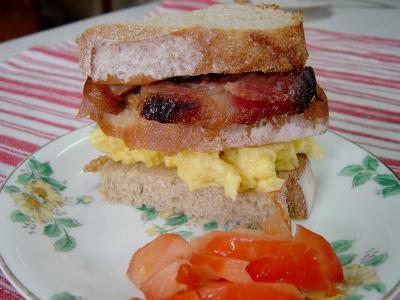 By the way i love breakfast and it seems that your blog is a good “foodspiration”. Oh that looks yummy! So simple and yet so satisfying! It’s dinner time here but I think I want ham and eggs!